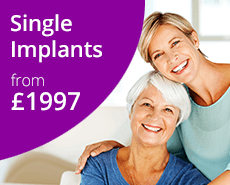 Restore lost self-confidence and vitality with stable, comfortable, natural-looking teeth through dental implants from the Dental Health Centre Grantham. Losing a single tooth can affect your smile, your confidence, the way you eat and the way your other teeth function. Leaving a gap can create a domino effect as adjacent teeth start to tip, trap debris and develop more problems often resulting in the loss of additional teeth. The best way to replace a missing tooth is with a dental implant, a long lasting alternative that is perfectly secure and will feel, look and work just like your own natural teeth. Not only does it replace the tooth but it prevents the bone shrinking away, which can cause that sunken mouth look as you get older. Unlike leaving the gap or having a bridge, a dental implant allows you to eat all of your favourite foods with greater confidence. When a tooth is lost, the remaining teeth bear the extra load of chewing, suffer additional wear and tear, and can drift, causing complications with the way your teeth bite together. A dental implant is an artificial root made from titanium that replaces the root of a missing tooth. It can be placed in either the upper or lower jaw and, in time, will bond with your jawbone to create a firm foundation to which a replacement false tooth is fixed. 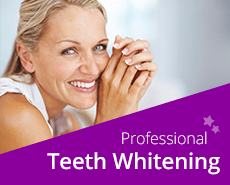 Colin Sutton, principal dentist of the Dental Health Centre Grantham, has a proven track record of implant placement. He has placed hundreds of implants successfully since 2001. The success rate for patients having implant treatment at the Dental Health Centre Grantham is extremely high at 99%. 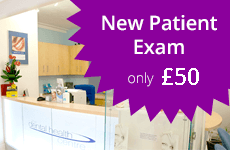 The Dental Health Centre Grantham is one of very few dental practices in the area to have invested in a 3D dental CT scanner. Our state-of-the-art scanner makes implant treatment, safer, quicker and more accurate for our patients and makes us one of the most technologically advanced dental clinics in the area. A lot of people who live around here think they need to go to London for the best care but they don’t realise what an absolute gem they have on their doorstep.